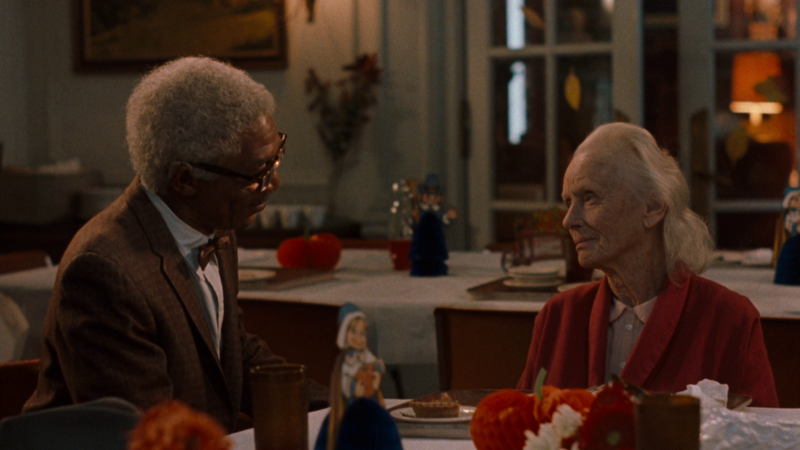 A simple two-person character study, Driving Miss Daisy enjoys excellent central performances but rides an utterly linear path to nowhere in particular. Georgia, 1948. Daisy Werthan (Jessica Tandy) is a stubborn 72 year old rich Jewish woman, living alone in her big house with her faithful kitchen servant. When she crashes her car in a driveway mishap, her son Boolie (Dan Aykroyd), a local businessman, insists on getting her a driver, and hires the elderly Hoke Colburn (Morgan Freeman). Hoke is amiable and professional but nevertheless it takes Daisy several weeks to admit that she needs help. Eventually she succumbs and accepts to have Hoke drive her to all her errands and visits. Daisy initially treats Hoke as the hired help and barely trusts him. But over the years she warms up to his company, and teaches him to read while he helps tend to her vegetable garden. Their friendship deepens and together they witness episodes of racism and antisemitism as the South goes through radical social changes. 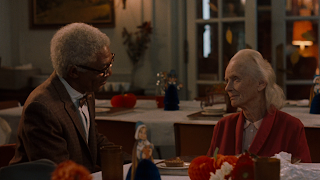 An adaptation of an off-Broadway play directed by Bruce Beresford, Driving Miss Daisy is a small, modest film, an intimate look at a friendship that evolves over 12 years against a backdrop of social upheavel. The focus on the complexities of relationships in the crusty elderly years is refreshing, and the film remains stubbornly faithful to a low-key pace and tone, consistent with the greying years. Daisy and Hoke are interesting enough characters to carry the film. Daisy is now rich but has never forgotten growing up in poverty, and she goes out of her way to avoid demonstrations of wealth. She is also headstrong, humourless, and set in her ways. Hoke is a survivor, keenly aware of the social position occupied by an older black man in the deep South of 1948. He is nevertheless full of wisdom, pride and unafraid to (always respectfully) express opinions that contradict his employers. The film establishes its premise and central characters in the first 30 minutes, and then sputters and occasionally stalls down the dusty backroads of history. While Tandy, Freeman, and (more surprisingly) Aykroyd are never less than excellent, the Alfred Uhry scripts struggles to find a narrative thrust. 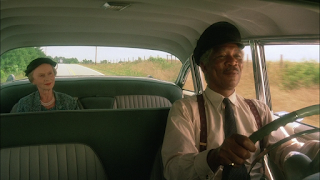 Driving Miss Daisy defaults to a series of vignettes, Hoke in the front seat, Daisy in the back, exchanging sometimes sharp but often superficial views as the years pass them by and the car models are updated. The little episodes add up to a deepening friendship, but precious little emotional resonance is actually generated. In an admittedly weak year, Driving Miss Daisy won the Best Film Academy Award, ahead of more celebrated movies such as Born On The Fourth Of July, Field Of Dreams and Dead Poets Society. Beresford was not even nominated for Best Director. Sometimes, an uncomplicated drive in the country remarkably seizes the day.